In a surprise announcement, two new Heroes were just announced at The International for Dota 2. The first Hero teased was Mars, which just had a quick still shot and a winter release date. And then, seemingly out of nowhere, they announced that another Hero, Grimstroke, is available to play now! Dota 2 is free-to-play and all Heroes are always free for everyone. I tested out Grimstroke quickly and have a video of all his abilities for those interested. He's listed as a support/disabler in-game and his abilities make that very clear. 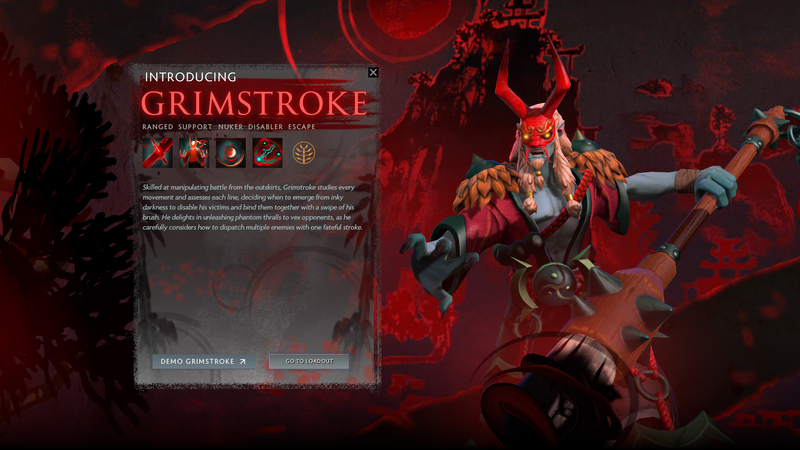 Grimstroke has an awesome demon-paintbrush aesthetic that I absolutely love. His first ability, Stroke of Fate, paints a line to the target point and damages and slows all Heroes in that line. The more Heroes it hits, the more damage it does. I love it because it's got that skillshot aspect to it, especially with the travel time of the line. His second ability reminds me of Arc Warden's Soul Wraith ability. Grimstroke's Phantom Embrace sends a spirit out towards the target, who then latches on and silences and applies damage. The opponents will need to attack the spirit (think Weaver's bugs) to get rid of it. If the spirit latches for the entire duration, it does burst damage. The third ability seems to be the reason for his support role. Ink Swell shrouds an ally in ink, silencing them, increasing their movement speed, and making them invulnerable to attacks. Enemies near the allied target take damage, and after three seconds, the Ink Swell bursts, dealing damage proportional to the damage given over those three seconds and stunning. His ultimate is called Soulbind and literally binds two enemy Heroes together. Any targeted spell that is cast on one enemy is then cast onto the bound enemy as well. HOW INSANE IS THAT!!! This guy is nuts and I love him.